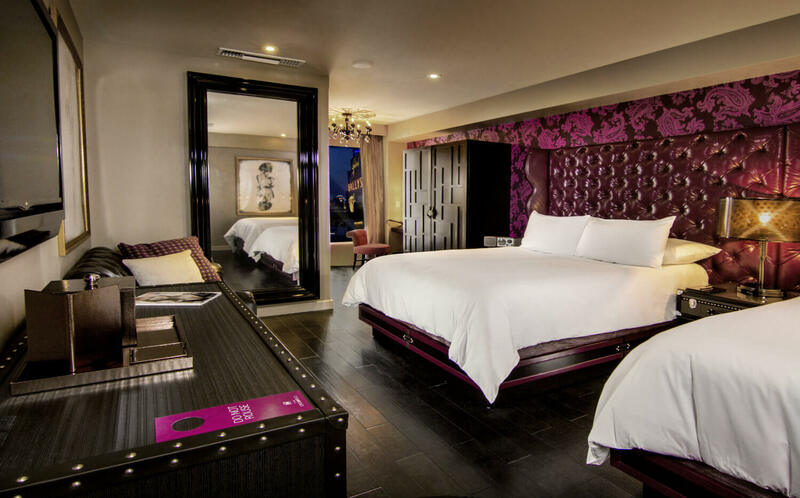 With a half-scale Eiffel Tower, a neon sign in the shape of the Montgolfier hot air balloon, and versions of the Arc de Triomphe and La Fontaine des Mers, the 2,900+ room Paris Las Vegas hotel makes quite an impression on the Las Vegas Strip. 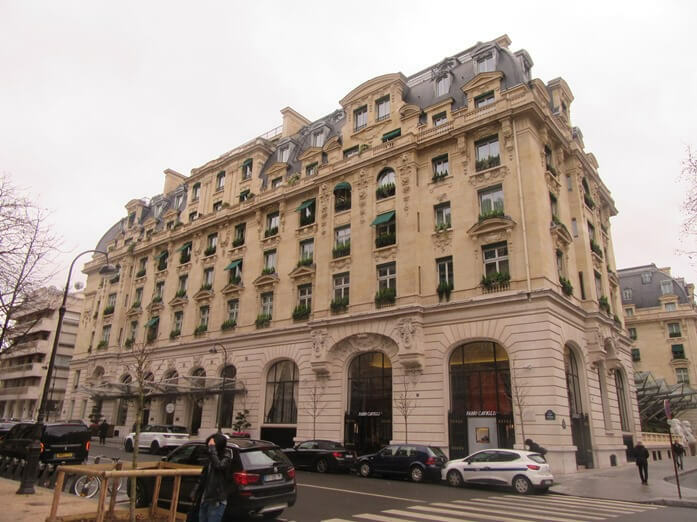 The front of the hotel looks like the Palais Garnier, the opera house made famous in Phantom of the Opera. 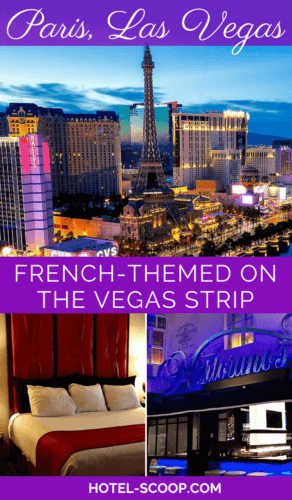 Step inside, though, and it’s a crazy combination of French-themed decor and the beeping of slot machines and the frenetic energy of a Las Vegas casino. Straight ahead are the legs of the Eiffel Tower, interspersed among restaurants and blackjack tables. To the right is the brightly lit reception area where, depending on the time of day, the check-in line snakes Disney-style throughout the lobby and back to the door. 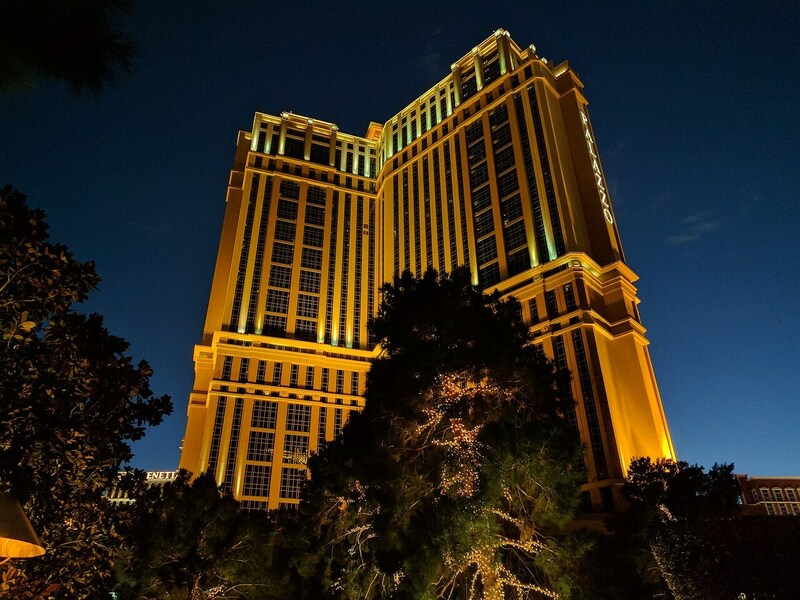 We were in Las Vegas to attend a trade show, so we dropped out bags off with the bellman out front, and headed for the promenade that connects to Paris’ sister property, Bally’s, and then to the Las Vegas Monorail station located at the back of the property. 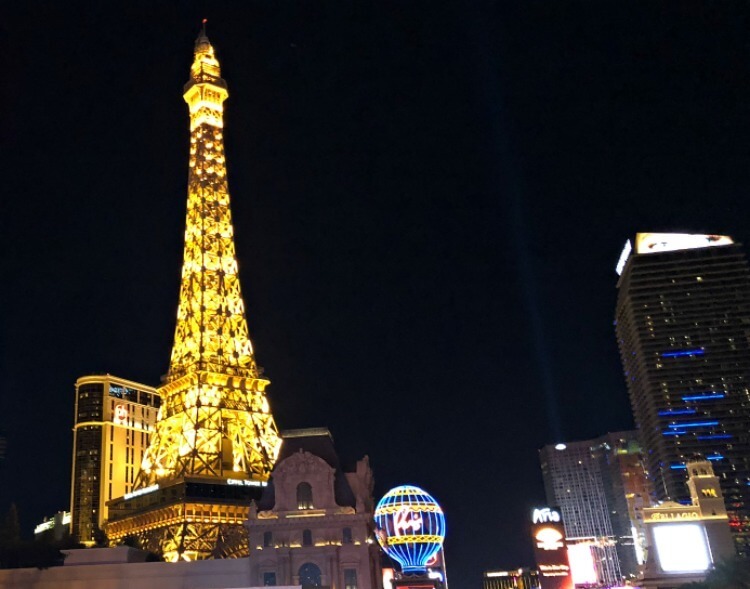 Our decision to stay at Paris was made because of the convenience and affordability of the monorail to the convention center because there was no way we wanted to deal with cabs or Uber on the Strip. Checking in at an off-peak time meant the process went quickly and we headed to the room and called to have our bags sent up. We were in one of the Red Rooms, an upgrade from the basic entry-level room (called the Classic) and located on the higher floors. Red Rooms incorporate a European-chic style with a sophisticated feel, and the puckered lips shaped sofa added a little bit of French kitsch. The bathroom is spacious with a separate tub and shower stall. Amenities include a refrigerator, coffee maker, ample plug-ins with USB options, flat screen with on-demand movies, and wi-fi. The room was big enough to lounge and work in without feeling like we were always running into one another. We had a room toward the end of a hall, something I would recommend, and hallway noise from other guests was minimal. Although the pool was closed when we were there, it was still a little too chilly to be lounging outside, the Soleil pool is located underneath the hotel’s Eiffel Tower. The pool deck and surrounding area cover a sweet two acres that are fashioned after a Parisian garden. 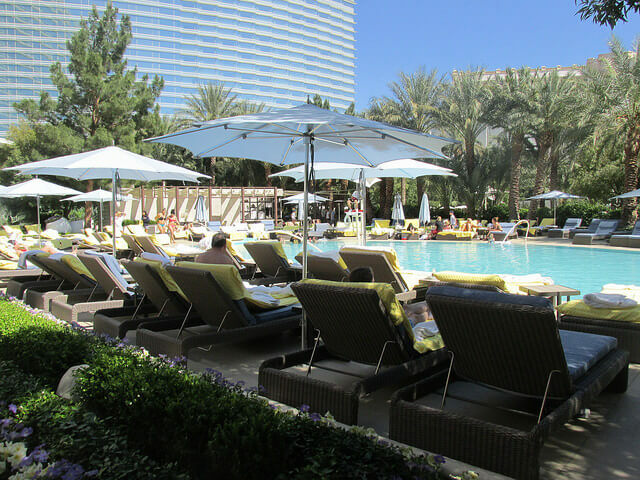 When open, you can grab a lounger on a first come, first served, basis or rent a cabana. Poolside food service and massages are also available. And speaking of massages, I didn’t have time for one on this visit, but on past stays, I try to check in at the Mandara spa for a relaxing treatment. The usual spa and salon treatments are available, most with a European twist, and if I’m in Las Vegas for any length of time, a massage is a real treat. This is also where you’ll find the fitness center, restricted to those over 18 years old. 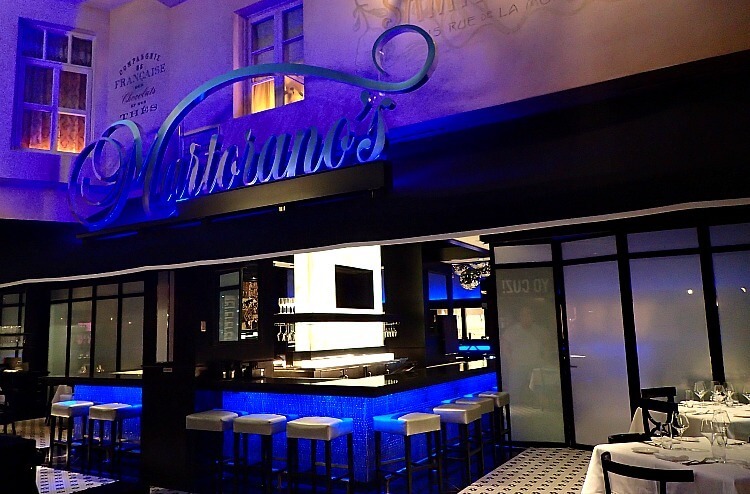 Martorano’s features the home-style Italian cuisine of South Philadelphia-born chef Steve Martorano. I wanted comfort food and the Rigatoni with Sunday pork gravy hit the spot. You’ll find the expected traditional Italian favorites along with a selection of craft cocktails. The wine list is diverse and affordable. We stopped off at Yong Kang for an afternoon snack of dumplings and a beer. Yong Kang features street food from China, Taiwan, and Hong Kong with a menu that includes dumplings, noodles, soups, and dim sum. I couldn’t pass up a trip to any Paris (in Las Vegas or France) without a stop off at a bakery for some macarons. They were good, although not great, but did the trick of setting the French mood. Las Vegas is one of the few remaining places where hotels still have smoking rooms. Ask for non-smoking if that matters to you. Rooms that face west toward the Strip will have a view of the Bellagio fountains. Additional fees apply for an early check-in (although I have never been charged for it) or a rollaway bed or crib. Save this to your favorite travel board and keep it handy for your next trip to Las Vegas. Paris Las Vegas is located at 3655 Las Vegas Boulevard South, Las Vegas Nevada. It is one of the Caesars properties in Las Vegas (you can read a review about the Cromwell, another Caesars property, here). Rates start as low as $49 in the offseason, although the hotel has a required resort fee of $37 per day which means that your actual rate will be much higher. During popular travel times like March Madness and New Year’s and major conventions like CES, room rates soar and it’s hard to find one under $250. 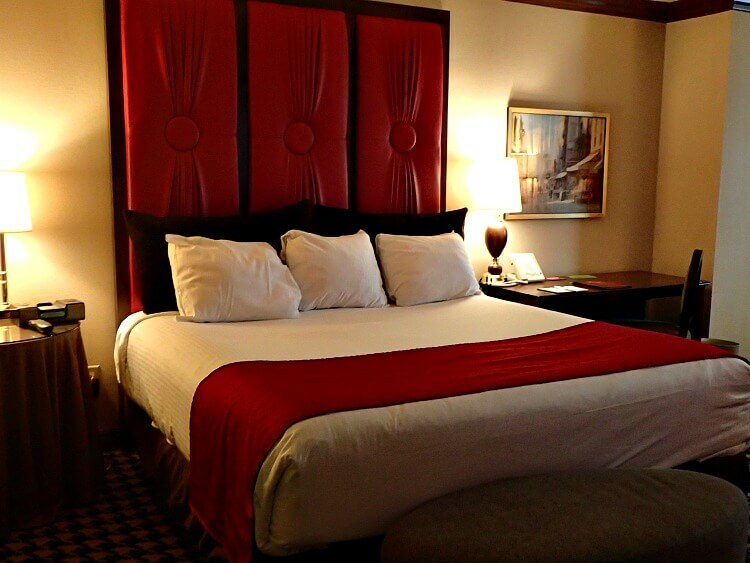 You can make your reservation directly online at the hotel website or a booking site such as Priceline or Expedia.